“We’ve inherited a very complex codebase and only 2 out of 6 members understand the flow in detail. How can we improve the groups knowledge, where do we start? We’re talking 10s of thousands of lines of code broken into 2 main projects. 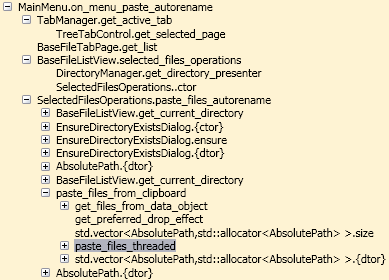 The code itself is difficult to understand, contains alot of Delegates which makes the Debugging a nightmare.” It is a very good example of the problem I want to solve (original message in Visual C# Forums). I was personally involved within a group inheriting 2 large projects in the last 2 years and I can attest that manually tracking control flow is very time consuming if sometimes possible at all. Clicking on a function in the tree navigates to its implementation in Visual Studio. Another way to describe the proposed solution is a use case based code navigation view. I have a (slowly) working standalone prototype for monitoring .NET 2.0-3.5 32-bit desktop applications. The above screenshot was made for SurF File Manager written in C++/CLR. I plan to present a downloadable alpha with Visual Studio integration in a month.